Vienna's software developers have taken the concept of convolution reverberation to the absolute authentic extreme. The application of more than 1,000 individual impulse responses (IRs) per room results in an enormous number of calculations that need a wealth of innovations to allow for flawless execution on a single 64-bit computer. Vienna MIR PRO combines specific directional frequency profiles with reflectional information from every instrument, assembling all of the acoustic interactions into an accurate and satisfying recreation of musicians playing their instruments in place and in space. Vienna MIR PRO is much more than just "a multi-sample" of a hall - and this is where it far surpasses any other convolution reverb available on the market. Vienna MIR PRO is multi-source, multi-directional, multi-positional, and multi-format. But, why all the effort? Imagine the sound of a B¶sendorfer Imperial Grand. Do you think it would be sufficient to record a single Middle C to make for a convincing virtual instrument? Of course not. You have to go for individual samples from as many keys as possible, sampled in as many velocities as the human ear is able to distinguish. The same is true for sampling a room. What the industry has had up to now are single samples from an acoustic entity much larger than even the biggest instruments. There's no way you can "play" a room like that. But this is what great rooms are all about - they want to be played by musicians, conductors, arrangers, just like any other instrument. This is the reason the Vienna Symphonic Library recorded multi-samples from great musical venues. Because every room has its own voice, with its own characteristics, its imperfections - its magic. Vienna MIR PRO comes as a dedicated plug-in in the formats AU, VST, AAX Native and RTAS, allowing you to run it directly in your favorite sequencer or DAW. Additionally, our Mixing Hosts Vienna Ensemble and Vienna Ensemble PRO 5 allow for a comfortable one-click integration of Vienna MIR PRO. *Please note that Vienna MIR PRO does not include any RoomPacks. Please add one or more Vienna MIR RoomPacks to your order (sold separately). 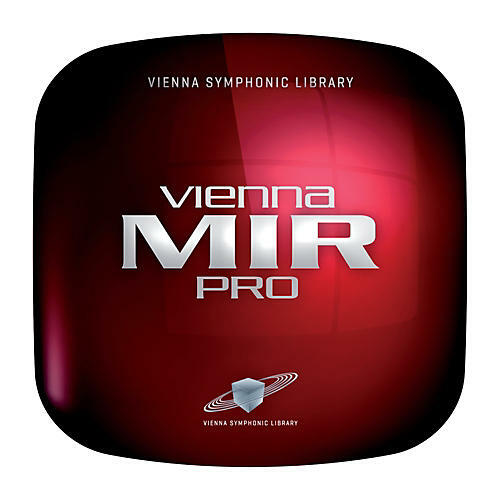 *Vienna MIR PRO comes with one license per purchase.